In the heart of Aix en Provence’s ancient quartier of Cathedral Saint Saveur, this extraordinary apartment in a grand home from the beginning of the 18th century will enchant you with its charming elegance. Remarkably quiet and private on the stately courtyard of the Hotel de Fontvert, which is on the official list of France’s historic buildings, Ambiance d’Aix is a small piece of paradise in the historic center. You will instantly note its distinctive 12 foot high ceilings, tall arched windows, and original hexagonal “tomette” floor tiles, gleaming with centuries of gentle care. 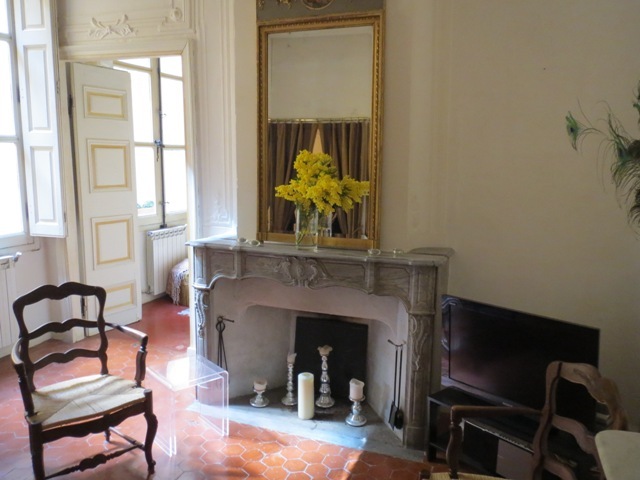 The apartment is beautifully decorated with French antiques and quality furnishings combining the spirit of the period with contemporary comfort and modern conveniences such as microwave oven, cable television, iPod/CD players, and high speed internet. a spacious living/dining room with its high ceilings and walls adorned with intricate original gypserie – plaster moldings with figures and ribbon designs – with views to a neighbor’s large, quiet, and sunny courtyard below. For news and entertainment, there is a Sony flat-screen high definition TV with French, German, English, and other language channels and a CD/iPod/iPhone player with radio. The dining table comfortably seats six people. Tastefully decorated and distinctively furnished with a combination of both contemporary and antique pieces, the apartment’s spacious rooms and windows open to either a neighbor’s courtyard or a quiet lane. 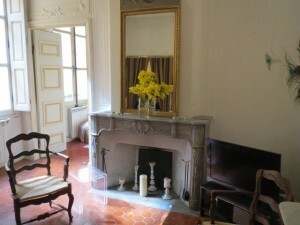 All the rooms are wonderfully light and sunny. The apartment has central thermostatically controlled heating for the cooler months, and stays warm in winter with its thick stone walls . For the warm months, there is good ventilation with through drafts as it has double exposure. Although we would not consider living without air conditioning in our Virginia home, we are completely comfortable in our Aix apartment even in the height of summer. In fact, we’re surprised to find how warm it is when we walk outside! The location of Ambiance d’Aix is superb for classical concerts, opera, and markets. In the original Roman part of Aix, the pedestrian Cathedral Saint Saveur quartier is only blocks from the colorful market squares of Aix – the flowers on Place de l’Hotel de Ville and the abundant and delicious produce of Place Richelme. Ten meters down our narrow lane is the beautiful Place des Martyrs de la Resistance, formerly the Place de l’Archeveche – a perfect place to sit by the fountain and enjoy a glass of wine, and the center of Aix’s Lyric Festival, the former Palais de l’ Archeveche (Archbishop). On this square is the Museum of Tapisseries, and around the corner is the Museum of Old Aix. Thousands of years of history – from Renaissance to Medieval to Roman and beyond – overflowing with architectural masterpieces, Aix en Provence offers today’s visitors the opportunity to explore winding, cobbled streets, visit stunning old buildings, appreciate the museums and galleries, scour the markets, absorb the plentiful musical productions and dine in its many delightful and colorful restaurants and cafes. Click here to see what previous guests have to say about Ambiance d'Aix.